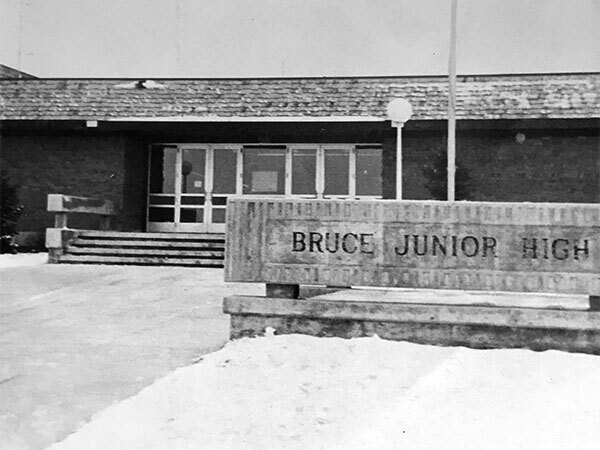 Planning for the Bruce Junior High School began in 1966 but it did not open for classes until September 1969. For the 1968-1969 school year, its students attended classes at Bannatyne School or Athlone School. The building was designed by the Winnipeg architectural firm of Ward, Macdonald and Partners, and constructed by William Dyck and Sons Limited. The official opening ceremony occurred on 11 December 1969. History of Bruce Junior High School, St. James Assiniboia School Division, 1974. “St. James - Assiniboine School Board,” Winnipeg Free Press, 15 May 1993, page A11. We thank Mari-Jean Nachtigall, Bill Cann, Rick Brownlee, Arnold Reimer, and Ron Crook for providing additional information used here.